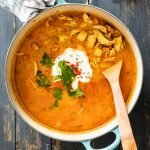 This chicken curry soup recipe is comfort in a bowl and perfect served with pillowy naan bread for an easy, wholesome meal. Curry in every way, shape or form is one of my absolute favorite meals of all time. i just can’t get enough of the rich aromas and flavors of all the spices in the rich sauce. During the colder months, we have curry and soup weekly and sometimes those two overlap. And when it does, it is a beautiful thing let me tell you. 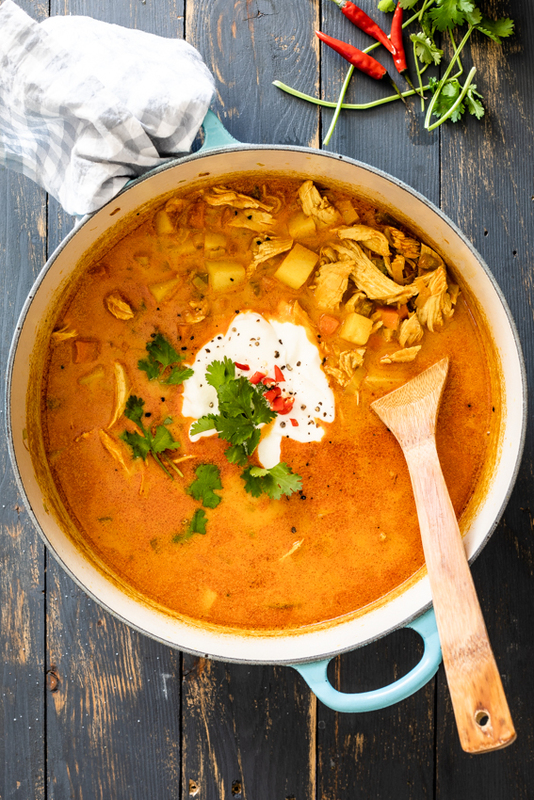 This chicken curry soup is going to become a family favorite in no-time. I’ve been making a variation of this chicken soup recipe for as long as I can remember. Adding warming spices to stocks and stews not only boosts the flavor but also adds so much goodness to the recipe because the benefits of spices are endless. Cinnamon lowers blood sugar, turmeric has powerful anti-inflammatory effects and chilli powder not only revves up your metabolism but the vitamin C in it also helps keep colds and flu at bay by strengthening your immune system. I mean, who doesn’t want all of that (especially in winter)? 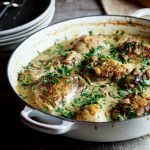 I poached the chicken breasts in the soup to keep things easy (I love a good one-pot recipe) and poaching the chicken in the rich, spiced broth develops even more flavor. I bulked the soup with cubes of potato but you could use butternut squash (or other pumpkin), sweet potato, cauliflower or celeriac. If you wanted to add more vegetables the soup any leafy green (hello kale!) or frozen peas would be great. Serve with a generous dollop of plain yoghurt and pillowy naan bread for dipping and you have the perfect weeknight comfort meal. Melt the butter and a splash of oil(optional) in a large pot. Add the onion, celery, leek and carrot and fry for 10 minutes until soft and fragrant. Add the garlic and ginger and fry for a minute before adding the spices. Stir together. Add the potato and fry for another minute before pouring in the chicken stock. Season with salt and pepper, add the cream and allow to come to a simmer. Add the chicken breasts then cover and allow to simmer for 7-10 mins until the chicken is cooked. Remove from the pot and allow to cool slightly. Place the lid back on the pot and allow to simmer for another 10 minutes. 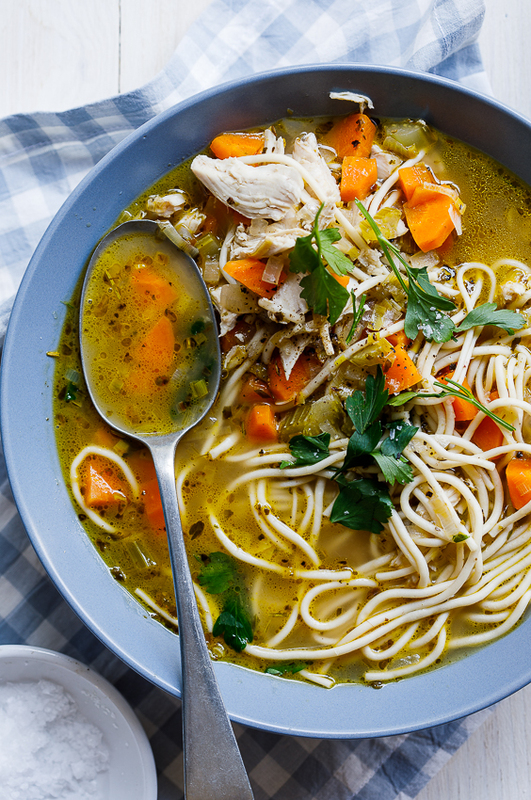 Shred the chicken and add back to the soup. Simmer for 5 minute then season to taste. Serve with plain yoghurt and fresh coriander/cilantro. This is such a great recipe. The broth was rich, creamy and delicious and I loved the potato. Delicious. So glad to hear that Jenni! I’ll definitely be lining this one up for the fall season Alida. We love curry dishes and this looks totally soul satisfying! You’ll love it Mary Ann! Are there printable instructions (not just video)? They are not showing up for me. (Just the ingredient list.) It looks SO GOOD! This recipe is so good. I’ve been making it since the first time you posted it. Delicious! Yay, thank you!! I can’t wait to make it! Where is the curry in this soup? The spices mentioned make up the curry element of the recipe. You can however use curry powder as well if you wish. Was so excited about this nana recipe, but I just could get it to work. It wouldn’t even come together in a ball. I’m going to try adding the dry to the wet this time…. ? Seems like way too much flour. I’m bummed! Anny, I will re-make this naan bread and amend the recipe if I find that I’ve stated too much flour. 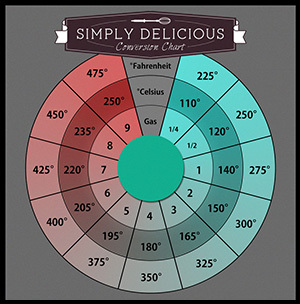 Regarding baking the naan – do I preheat oven to hottest setting and leave it at that when baking? Mine goes up to 500F. Also, do you bake first in oven then out on the grill? I have baking stones for my grill. Can I just do all on the grill and skip the oven step? Can’t wait to try. My family loves naan. Lori, it’s just important that your oven is at the hottest it can be. You can grill it as well, just make sure that it doesn’t burn. Oh, I’m sorry… I think this is your website. I was routed here from my Iphone app “Food Gawker”. I would love to try any other of your recipes you can offer… website, email, however. Thanks again! 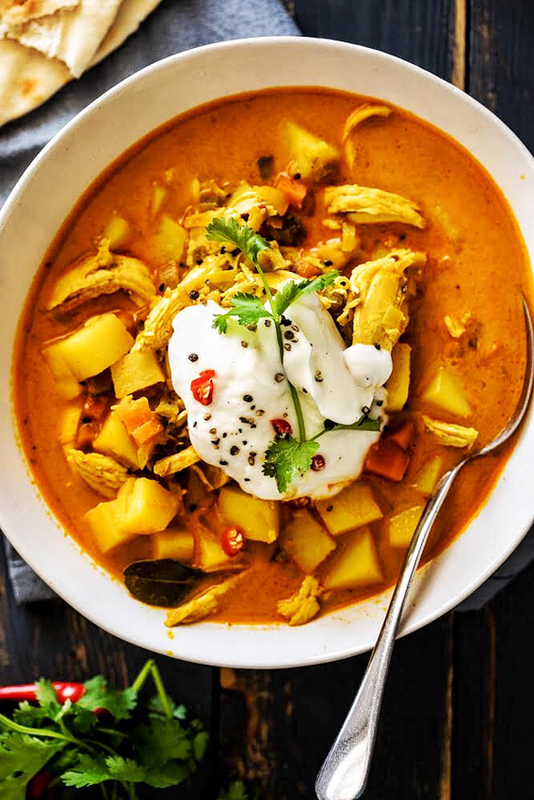 Just made this… It’s the best recipe for curry I’ve ever tried. It came out so bold and flavorful and was pretty easy too. I added red potatoes and peas. 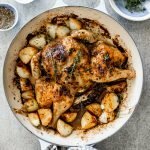 I go through so many recipes over the net that are not up to par but this one is a WINNER. Thank you! The pleasure is all mine… there’s curry dripping down my chin as we speak (again!) lol. I’m definitely going to buy the cook book! Rachel, I’m so sorry the recipe didn’t work. I make this Naan bread all the time so I can’t imagine what could’ve gone wrong. You don’t mention the melted butter, did you include that? I’m not sure if Almond milk will make a difference as I’ve never cooked with it but I can’t imagine it will. Next time you make it, perhaps try to add more milk and oil and knead until the dough comes together, you can even use water. I’m trying to think what else could’ve gone wrong but I really can’t imagine what it could be as I make this all the time, as I’ve said. It didn’t work for me either. The soup was delicious, but the bread was way too dry, I kept adding water & oil to it, had to add quite a bit. It came out of the oven as hard rocks. You asked the previous poster if she included butter, the recipe only says to brush with butter, was the butter suppose to be incorporated into the dough? The proportions of wet/dry seemed off to me… 4 cups of flour to only 4 tb oil, 1/2 cup milk & 1 egg? Maybe I’m missing something? Thanks! Jess, no, I made a mistake in that comment, the butter doesn’t get included. I can’t imagine why it’s not coming together and why it’s going rock hard. I’ve made this bread so many times. I’ll bake it again in the next week and will just make sure again of quantities. I apologise for it not working, I hate when recipes don’t work. I’ll re-post here once I’ve re-tested the recipe. No, did not have any luck with it either. The ratio wet to dry see a way off. I’ll re-visit this recipe and try to see where the fault lies. Is the Naan recipe missing yeast? Hi Stephanie, no it’s not. That’s the beauty of this recipe. It works perfectly, I promise! love the flavor of chicken curry soup, your home made naan looks great! By tin of tomatoes do you mean a can? How much? Yes, one tin. In SA they’re about 475g I think. Thanks Ally! I researching them online, hopefully they will turn up, i gotta have them! I am in LOVE with these dishes! Do you mind telling me the brand or where you got them? Can’t wait to try this recipe, thanks for sharing! Stacey, I got them at a South African store called Woolworths. They were apparently hand-made in Portugal. -47 degrees C today! Might be the day to try this beautiful recipe!!! Hmm… warm in a bowl! Yay I blogged about my success with this recipe! Thanks so much for a lovely dinner. I would definitely be in for curry soup! And those naan breads just seal the deal. Gotta make this. 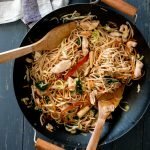 Love the recipe but have you tried to print it? Please could you ask your webmaster to create a link to a printer-friendly version. There is a print-friendly version, at the top of the post, just underneath the title, you’ll see 9 little icons. One of them will be a print option. That looks divine!!!! OMG! Bookmarked to make soon! Love your Naan, they look awesome! 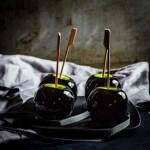 The beauty of this post just…oh, it’s so pretty! 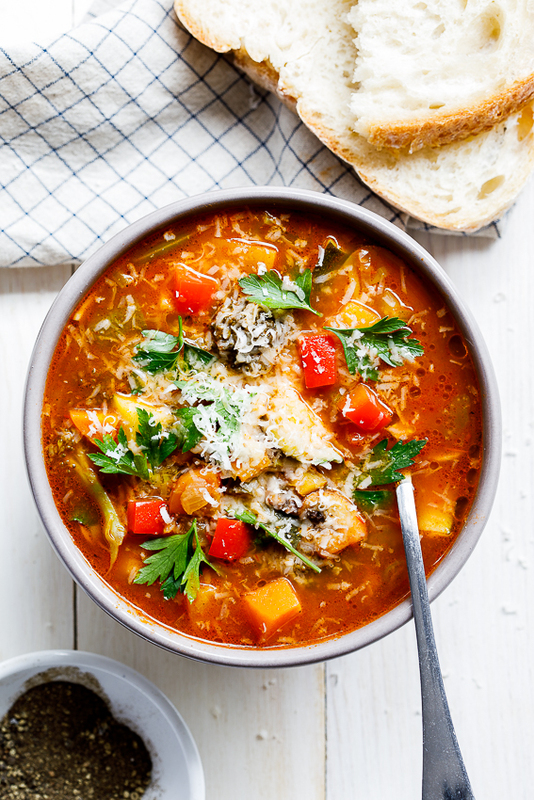 Love the photos, the bowls you used…the soup looks SO crazy good. Everything about this post is so perfect. You have a lovely blog! This looks so good! 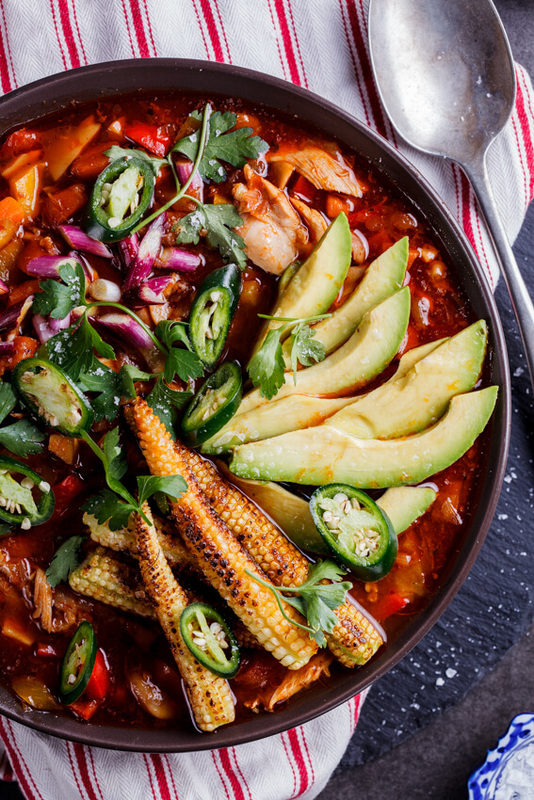 Where was this when I needed warm, spicy comfort food all winter?! 🙂 I will bookmark it for a rainy summer day. Yum! I got a curry chicken soup from Woolies recently that was surprisingly good. So I’m definitely interested in making a version at home. Thanks for the recipe! That looks stunning and exactly what is needed in freezing CT today. I love naan bread so am keen to try this recipe. Lovely…. looks delicious !! Have a nice day ! Sam : This naan recipe is so easy and the bread comes out really delicious. Mandie : I didn’t know they had curry chicken soup, you must try this! It’s sooo yum! 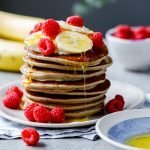 Lindsay : That’s always the problem with reading blogs in different hemispheres, right now, I’m craving all the salads and beautiful fresh foods that Summer brings! Tess : thanks! Naan is one of my favourites!